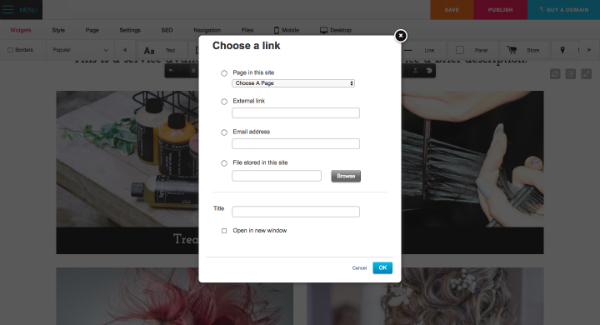 You can easily turn pictures into clickable links - another effective way to help people navigate your site. 1. 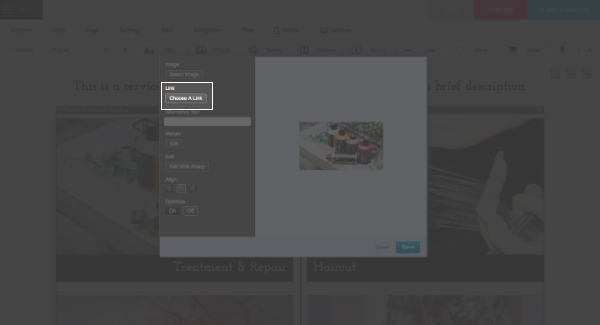 Add the picture to your page, using a Picture widget (located in Widgets and selecting Popular from the drop-down menu). 2. Hover over the Picture widget and click Edit on the top left corner of the widget. 4. Click Choose a Link. 4. The Link Editor dialog box will open, add a link to one of the four categories and then click OK.
6. To check that your link is working, preview your page and then click on the link. Hint: If you insert your picture in a Text widget (instead of a Picture widget) you can turn it into a link by selecting the picture and then clicking the "Link" button (looks like a chain link) on the Text Editing Toolbar. From there, follow the same steps as outlined above.